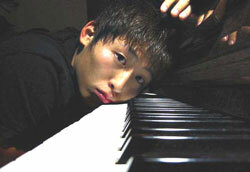 Dong-Ji Moon ’s musical education was greatly influenced by his mother who is a pianist and teacher. He came to America in 1997. 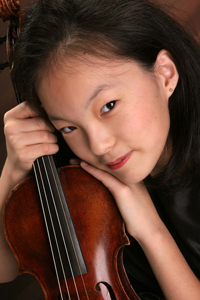 He participated in the Montgomery County Honors String Orchestra and has been awarded by The Old York Road Symphony. He is currently studying composition with Dr. Brodhead at Temple University . “ Hae - ga San M a - loo - eh Ju- mool - uh - do ” (해가 산마루에 저물어도) based on a poem by So Wol Kim: Melodically, this piece mostly uses a minor-pentatonic scale that is based on key signature. Every pitch in this scale is exactly matched with her feelings, so it could express her pains so well. It modulates five times by major-pentatonic scale (f-g-B flat-c-d) instead of minor-pentatonic which represents the composer’s hope for happy ending. Mostly, the pitch is based atonal harmony, but it also uses quintal harmony. To me, it comes to an end by the reason of you. To me, the bright morning breaks by the reason of you. To me, all these happen by the reason of you. My never ending love to you will follow you like your shadow. Oh, my beloved, my dear heart. 내게 두고는 당신 때문에 저뭅니다. 내게 두고는 당신 때문에 밝은 아침이라고 할 것입니다. 내게 두고는 끝까지 모두다 당신 때문에 있습니다. So-Wol Kim (1902-34) is one of Korea ’s most famous poets. His most significant achievement was the flexibility and versatility he achieved in the use of the Korean language. In this poem, he presented the sorrow of a woman who was left by her husband. Here, he indicated the East Asian culture of woman that always had been on lower position than man. Basically this poem is all about her grief and yearning for her husband.